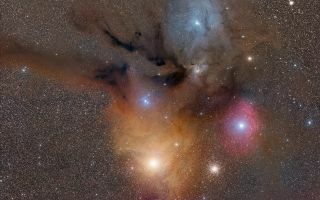 “Runner Up” of the “Deep Space” category in the Royal Observatory Greenwich’s Astronomy Photographer of the Year 2013 exhibition, this beautiful space wallpaper shows Rho Ophiuchi and Antares Nebulae. “Runner Up” of the “Deep Space” category in the Royal Observatory Greenwich’s Astronomy Photographer of the Year 2013 exhibition, this beautiful space wallpaper shows Rho Ophiuchi and Antares Nebulae. The smoky appearance of the dust clouds in this image is fitting, since the grains of dust, which make up the nebula are similar in size to particles of smoke here on Earth. The dust can reflect the light of nearby stars, as seen in the blue and yellow regions. It can also block and absorb the light of more distant stars, appearing brown and black in this image. To the right a bright star is ionizing a cloud of hydrogen gas, causing it to glow red, while below it far in the distance, is a globular cluster containing thousands of stars.